January 22, 2004 Happy Chinese New Year! It’s the year of the Monkey, and since Cherokee’s rebirth is spring of ’04, she shares traits with the monkey – agile, quick, and smart. She can get in and out of tight places, and plays well with humans. Keith Rittmaster, head of the NC Maritime Museum’s Cape Lookout Studies Program, snapped this shot of Cherokee off the Cape New Year’s week. 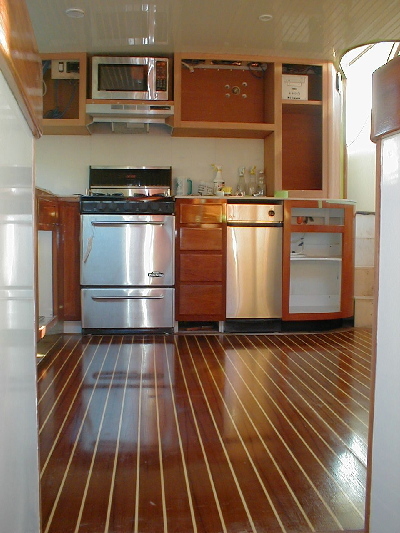 Meanwhile, back at the berth, Bryan and Chris laid the galley flooring and trim. 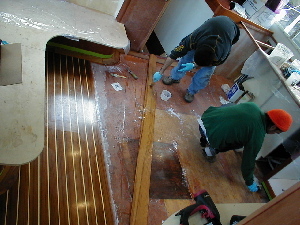 Below left they’re placing the last bit of trim, and right shows the completed floor. The empty area to the right is where the refrigerators go. 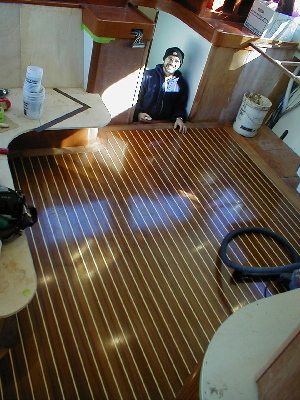 The Varnish Vixens are working their way through the galley trim, sanding and sanding in preparation for many coats of varnish. Sharon and Caroline are padding about in socks, keeping everything scratch free and pretty. 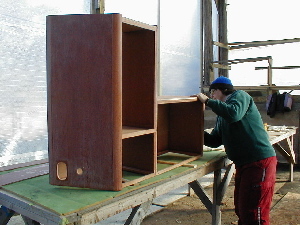 Below right, Carolyn’s mother Margaret is in the facility sanding a galley cabinet. 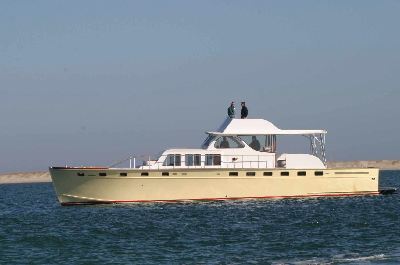 Speaking of the facility, it’s no longer a gaping void since the Cherokee launch. 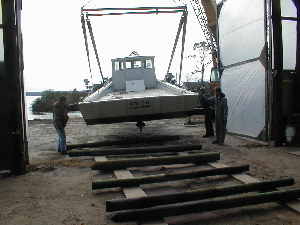 Lloyd Pigott had George lift the CBCII (Core Banks Club), an old ferry boat, into the shed whereupon it’ll get converted into a houseboat (see bottom photo). 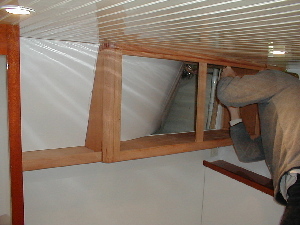 Tom Parker, above, is building a storage cabinet in the forward stateroom over the bunk. 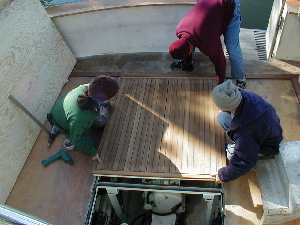 Bryan and Chris glued the teak on the first hatch of the cockpit, and attached the hinge. They and Leonard are shown below fitting it in place. 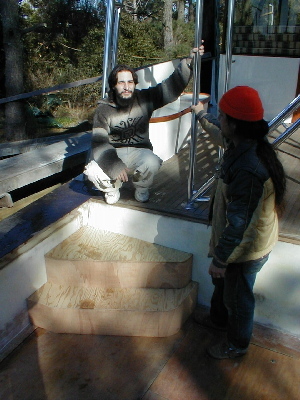 Chris and Bryan started the cockpit stairs, designed to be used to enter the cockpit from the aft-deck or the dock. Once completed, the stairs will have teak treads and white risers. Below Bryan and son James check it out.